In celebration of our long Labor Day weekend, we got a pass from the library for deeply discounted tickets to Beardsley Zoo. 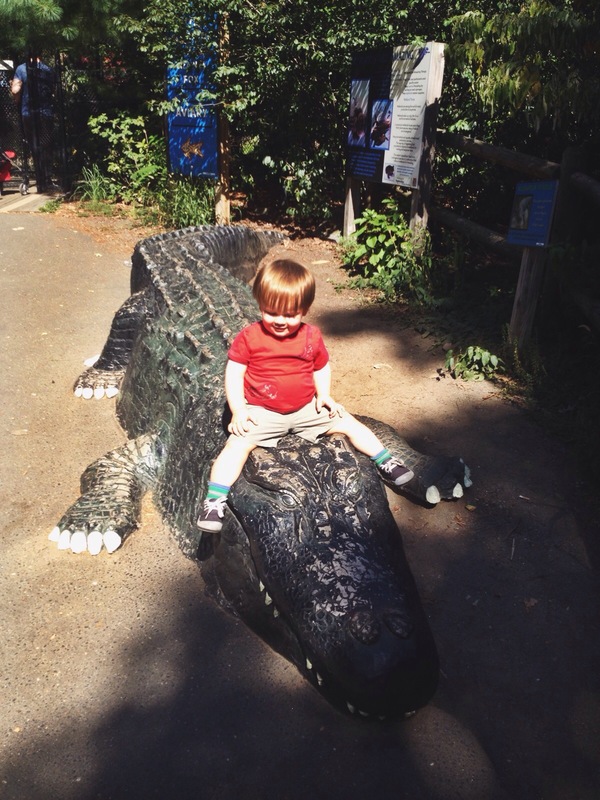 Christopher is really into trucks and animals – the two major species of beloved things for toddlers – so we hoped the zoo would be fun for him. Those animals delivered. He walked through most of the zoo that morning, quite a feat for little buddy legs, pointing and squawking at the wolves and ducks, and remaining totally neutral toward the anteaters that had captivated his parents. We took a break for our packed lunch accompanied by the zoo’s peacock and then visited the carousel. Christopher was a little afraid of it at first, but he got more and more interested in the fiberglass animals, especially his most recent favorite creature, the elephant. I was feeling sentimental, so I forked over $2 to take Christopher for a ride on that pachyderm. I sat him down on the elephant’s back and he immediately freaked and tried to climb off. 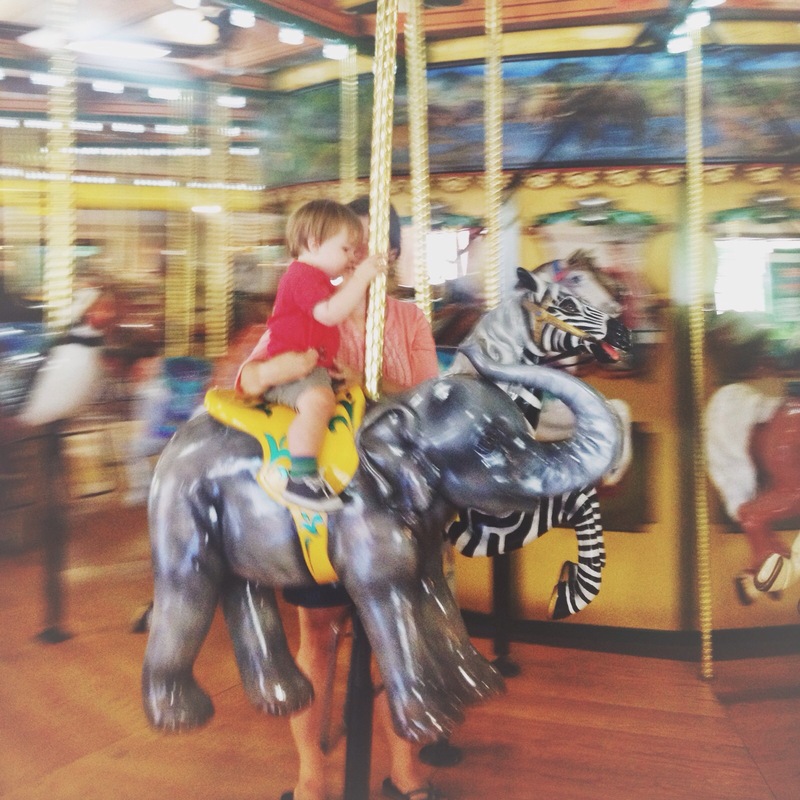 I reassured him and held him tight as the music started and the carousel turned. He slowly perked up and put on his determined “I got this” face, which never fails to make me laugh a little. It was one of those heart-grew-three-sizes moments. It was so sweet; I started crying on the carousel. I’m trying to learn that these transcendent moments are consolations from God in what is often the grind of my vocation. They’re super-graces that don’t “make it all worth it” – it would be worth it if it were hard all the time – but they always draw my heart to thankfulness. My vocation is a good in itself. I was talking to a friend recently about how life is just hard most of the time and maybe we’d be happier and more content if we didn’t think it was supposed to be easy and took the words “consider it all joy” more seriously. Love has its own law of gravity: hardships born in love and for love only fan love’s flames, drawing others to its warmth and light. Love patiently rises above hardship and all kinds of persecution, even in what seem to be insurmountable circumstances and crushing setbacks. Love does not need to force circumstances or control situations, but makes use of everything, even failures and inadequacies. This kind of love is the greatest antidote to all of my “if only” desires. “If only we had more money, I could get more toys for Christopher.” “If only Christopher slept more easily, I would be less angry.” My worst days come from feeling deserving of comfort or deserving of a constant carousel-induced heart swell. Greatness comes in the small things. The expansion of heart in motherhood comes from the habitual stretching of grace in the daily grind.